We Are Here to Revitalise Your Property! 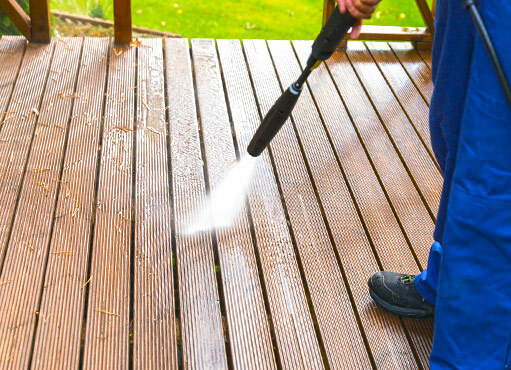 Whether it is grime on your walk way, streaks on your deck, or grease on your driveway, a good power wash can take care of just about anything! We have a team of enthusiastic technicians that have everything it takes to provide pressure washing services Etobicoke residents can count on. At NICK’S Window Cleaning, we make it a point to go above and beyond to give you a stress-free experience. Our arm of excellence sweeps across the GTA, satisfying every customer in our path. Whether you have a small home or a mammoth commercial property, no job is too big or small for our eager team. Power washing is a sure fire way of getting rid of any stubborn dirt from any surface. But this has to be done by a qualified professional. This is no DIY task and the wrong approach might damage your property and even leave you injured. You can never go wrong with professional power washing services from the right company. Take it from us – a pressure washer can be dangerous. It needs well-trained hands to make sure the job is done in a safe manner. It can be a tricky process that the average person might not perform correctly. NICK’S Window Cleaning comes with full liability insurance as well as WSIB coverage. You can enjoy our services with peace of mind! We have positioned ourselves as a leading provider of pressure washing services Etobicoke residents can rely on, no matter the size of their task. We can restore your homes beauty and spruce up your commercial property. We emphasise a thorough, great experience. That means we will give you great pressure washing with a friendly smile on our faces. Our expertise knows no bounds. Whatever the job you can count on us! Our touch will make your home the shining star of your block. We painstakingly go over every detail to make sure no stone remains unturned until your property looks new again. 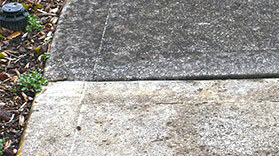 Our specialised equipment can wash away any stubborn dirt from mildew, grease, gum, to unsightly grime. You might think pressure washing is something you can do by yourself over the weekend. But that could not be any farther from the truth. Once you get to doing it, you may realise that you have done some damage that you cannot reverse. To make matters worse, most insurance policies do not cover damages you inflict upon your property yourself. So, before you wander off into a Walmart to get pressure washing equipment, here are some reasons why you might want to think twice and leave the job to the pros. Pressure washing requires specific know-how: There is more to operating a pressure washer than just firing it up and aiming its water blasts at dirt. Your property probably has a number of different surfaces and each one should be approached differently. The pressure has to be just right. If it’s too high, you risk stripping material off the surfaces. If it’s too low, all you will end up doing is compacting the dirt. At the end of the day, you will only make things worse. A team of professionals will have all the technical knowledge required to get the job done effectively. You will waste time: When you think about how much time you need to do the job by yourself, you probably only consider the time it takes to do the cleaning alone. But that is inaccurate. You also have to take into account the time it takes for you to hire and haul the equipment to your home. Then add to that the time it takes to learn how to run the machines. Compare this with simply giving the pros a call and watching them get the job done in a short time. You risk injuring yourself: The blast of water that comes from pressure washing equipment has to be high enough to wash away stubborn grease, grime, moss, algae, and other contaminants. Unfortunately for the DIYer, the pressure is high enough to inflict serious injury when the equipment is mishandled. Professionals, on the other hand, have all the requisite handling techniques to ensure safe cleaning. Pros have the right tools: You won’t get much done with a weak pressure washer. The average domestic machine won’t have enough power to blast away some of the most stubborn dirt on your surfaces. Professionals come with updated cleaning equipment as well as the latest industry practices. In short, you can save yourself a lot of time, money, and safeguard your property just by hiring pros instead of doing the cleaning yourself! Contact the pros today!